The Auburn Optimist Club has been busy preparing for Santa's arrival. The jolly old elf will return to his Auburn headquarters on December 6 where he will be available for pictures and to talk with all the hopeful youngsters who want to convince him that they have been nice (not naughty!) throughout the year. The Santa House has been a tradition in Auburn for more than forty years. It will be open through December 24. See the complete schedule here. 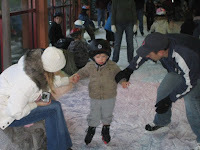 Other fun holiday activities include the Santa Parade and Tree Lighting! More than 5,000 Boise State Bronco fans attended the Boise State - Nevada football game on November 22 in Reno. Boise won. On that same day, Boise won on yet another front when more than 5,000 volunteers came out to assist others in the Annual Rake-up Boise event. The Boise Noon Optimist Club was one group that made the day special for over 700 senior and disabled Boise residents. Shown here is Don Gunner, Boise Noon Optimist member, chatting with Beth Sterling, recipient of the kindness. 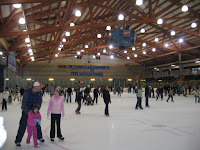 The Abbotsford Optimist Club hosted 426 children at the Annual Youth Skate on November 11 at the new Abbotsford Recreation Center. Participants were asked to bring a canned food item for the food bank and two large barrels of food and more than $400 were collected. The Oregon City Optimist Club is proud to announce that two young ladies have advanced in the NFL Punt, Pass & Kick Contest. Catelyn Preston, 13, and Sierra Walker, 10, earned high enough scores in the PP&K Team Event and are once again qualified to compete at the Seattle Seahawks game on Nov. 23. Catelyn and Sierra have a long history with the contest. Catelyn has advanced to the Seahawks Team Championship four times. She won the Seahawks Team Championship in 2006, and placed in the top three two other times. Sierra won the Seahawks Team Championship last year and went on to finish third in the nation in the 8-9 girls division, competing at halftime of last winter’s Indianapolis Colts vs. San Diego Chargers playoff game. Immediate Past Governor Steve Andersen unveiled his choice for PNW District Optimist of the Year. Boyd Yaden, come on down! 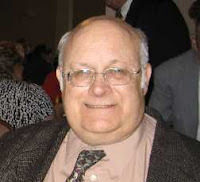 Boyd is a member of the Portland NE Optimist Club and is the Lt. Governor for Zone 3. Boyd was nominated by long-time friend and Optimist Macil Flye. According to Steve, Boyd was chosen for his work in developing the JOOI Club in Clackamas and ongoing efforts to build awareness for Optimist Clubs and projects in the schools. Please join us wishing congratulations to Boyd for his accomplishments and dedication to the PNW District of Optimist International. It is an unofficial opinion, but this writer believes the Flintstones and Rubbles should be named as honorary Optimists of the PNW District. We know that they already belong to the Royal Order of the Water Buffalo, but inclusion and partnerships can only take our clubs that much further by giving us more hands to serve our community. Diversity, partnerships, unity and progress were the themes for the First Quarter PNW Optimist District Meeting in Gig Harbor, WA. Governor Peter Smith presided over his first meeting as District Governor. Vice President Tommy Vaughn smiled, cajoled and inspired the group to ask questions, but work together. Governor-elect Linda Jackson reminded everyone that we were on this journey together. And the Leadership Development Team of Ed Murphy, Jean Jensen, and Linda Jackson offered tips and tools for leaders, members, and members aspiring to be leaders. A great start to a great year! Shown above are Dr. Tom Hammond, Trenna Garcia, Sue Thompson, and Bill Garcia of the Bedrock...err... the Meridian Optimist Club. What a fantastic event! Seventy-six kids ranging in age from 5 to 18 were honored by the Jerome Optimist Club at the 10th Annual Youth Appreciation Awards on Wednesday, November 5, 2008. In order to be recognized, the student had to be nominated by a teacher, parent or person in the community that witnessed the recipient doing an act of kindness or something above and beyond their daily routine to help another person or cause. By partnering with the Jerome Rotary Club, the Optimists were able to present each student with a certificate, their nomination letter and a $10 gift card. Optimist member Sheri Mitchell has organized the event on behalf of the Optimist and Rotary Clubs for ten years and the Honorable Thomas H. Borreson has presided over the ceremony since its inception. The youths were accompanied to the event by parents and family members. Judge Borreson made a special acknowledgement to the families for providing an atmosphere at home that encouraged the kids to give of themselves to others. Twin Falls newschannel KMVT recorded the event. Watch the video here. It's finally over! The US 2008 election has come to an historic close by electing the first African-American president Barack Obama. Some close races in our states and counties are still waiting to find out who will go to Washington D.C. in January as Congressmen and women and Senators. What needs to happen next? According to the Gresham Optimist Club now is the time to clean up the signs from our yards and our roads and get back to the business of serving kids and community. 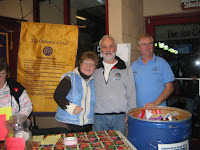 The Gresham Optimist Club and the City of Gresham, Oregon have launched a recycling program for campaign collateral. Campaign signs are dimantled and recycled for free and the wooden stakes are donated to the Gresham Optimists who then redistribute them to needy residents for firewood. Read more about the program here.